Its official, David Navarro has rescinded his contract with Valencia CF and will join Neuchatel Xamax on a free transfer and technically as a free agent. David Navarro has been in Valencia CF since his youth days, coming from the youth team to the Mestalla team and then coming to the senior team in year 2002. 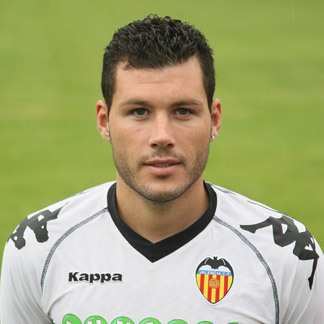 David Navarro did not feature much in the first team and was loaned out to Mallorca in 2007 for two seasons, before coming back to Valencia in 2009. He was used more under Emery, but ultimately he has never been able to achieve a stable starting eleven place and was often criticized by fans about his defensive mistakes and his slowness. Right now Valencia CF has Adil Rami, Ricardo Costa and Dealbert as central defenders. You can count Maduro as well, but he is originally a midfielder and is not absolutely suited as a center back. Personally I'm glad Valencia CF is getting rid of some of the fringe players, who haven't really been that good and hopefully we'll strengthen the team with one more center back after the arrival or Rami and have R. Costa and Dealbert in reserve.